Jurassic World 2 is getting very near production and now that director J.A. Bayona is free of his promotional duties for A Monster Calls, he can pour all of his focus into the highly-anticipated sequel. As production nears, more of the puzzle is falling into place. Today, we've learned who one of the new cast members will be. Actress Daniella Pineda, who is probably best known for her work on the TBS comedy The Detour, has reportedly been cast as one of the new leads in this follow-up to the 2015 blockbuster. 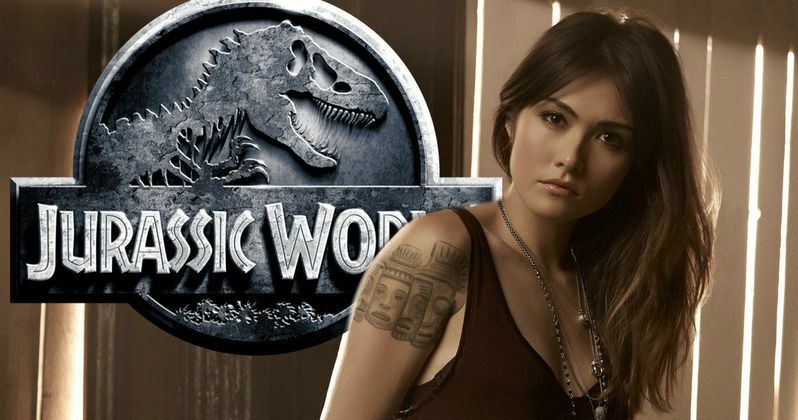 Variety broke the news that Daniella Pineda has joined the growing cast for Jurassic World 2, but unfortunately, there wasn't any word on who she is playing or what exactly her role will be. The report did note that she will have a "key role" in the follow up to Jurassic World, so it seems like she will be much more than just a fluffy supporting character or raptor food. She could definitely still be T-Rex prey, but it appears she would be pretty important prey, if that winds up being the case. As of right now, the only cast members from Jurassic World that have been confirmed to return are Chris Pratt and Bryce Dallas Howard. Recently, Jurassic World 2 also brought on Rafe Spall, Toby Jones and The Get Down star Justice Smith, all of whose roles are also shrouded in mystery at the moment. For now, Universal is remaining very tight-lipped on the details. The only other word we have had in terms of casting for Jurassic World 2 came in the form of a casting call that was for a character named Lucy, a 9-year-old who will reportedly be another key figure in the upcoming Dinosaur sequel. There is still no word on Ty Simpkins and Nick Robinson, who played the two brothers in Jurassic World, and their potential return. Outside of the casting of Daniella Pineda and the other new additions, we do know a few additional things about Jurassic World 2. We know that some filming will take place in Hawaii, meaning there will be some classic dinosaur island action. But Jurassic World director Colin Trevorrow, who is writing and producing Jurassic World 2 and handing over directing duties to J.A. Bayona, has promised that this movie will progress the story and not just be dinosaurs chasing people around an island. Director J. A. Bayona, for his part, has revealed that the movie will be "darker" and "scarier" than its predecessor. He has also said that the movie will deal with the concept of animal abuse, using the dinosaurs as a way to mirror our treatment of animals in the real world. It has also been said that there will be more animatronics in the sequel, which is something that should excite long-time fans of the Jurassic Park franchise. The first Jurassic World became one of the most successful movies of all-time, grossing $1.67 billion worldwide. That exceeded even the wildest expectations anyone had, especially considering the franchise had been dormant for 14 years after the negative reception to Jurassic Park III. Jurassic World 2 will now be the second part of a trilogy that Universal and Legendary Pictures are now planning, given the success that the fourth installment of the Jurassic Park franchise enjoyed. Jurassic World 2 is expected to start filming next month and is scheduled hit theaters on June 22, 2018.